A nor’easter that will affect the Jersey Shore from Monday into Wednesday has prompted officials to issue a coastal flood watch and a gale warning for the area, with as much as two inches of rain projected to fall. According to a briefing package issued by the National Weather Service late Sunday, forecast rainfall amounts have increased along with the threat of flooding as the storm is expected to move slower than initially expected. A coastal flood watch was in effect for the entire coast of New Jersey as well as Delaware Bay on Monday for moderate tidal flooding. A gale warning was also issued for New Jersey’s coastal areas, with a storm warning issued for inland and northern areas. Northeasterly winds are forecast to increase to 10 to 20 m.p.h. on Tuesday with gusts to 25 or 30 mph possible, especially closer to the coast. Depending on the track of the storm, the wind could be stronger, the briefing warned. 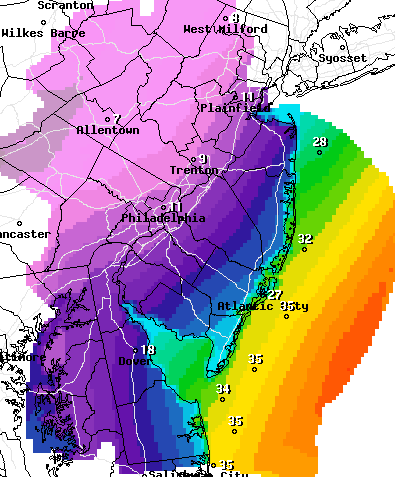 Seas will run 8 to 13 feet Monday and 11 to 16 feet Tuesday. Precipitation is forecast to overspread the region from the south Monday afternoon, likely after 3 p.m., and continue through Tuesday before tapering off Tuesday night or Wednesday, according to a forecast by the National Weather Service’s office in Mount Holly. The high Monday will be 44 degrees and the high Tuesday will be 49 degrees. “At this point, due to the track of the storm being close to the coast, most areas will experience mainly rain,” the forecast said. A map provided with the briefing showed a possibility of a relatively minimal amount of snow in far northwestern New Jersey; coastal areas will only receive rain. Metedeconk River: 10:59 a.m. Mon., 11:33 p.m. Mon., 11:42 a.m. Tues.